"This is not an accurate representation of my parents. But they are Asian"
This sounds about right. And by mid 30, forget men, just have a child. Don't worry about marriage, just have a child. By late 30s, YOU ARE GOING TO DIE ALONE! that sums it up. Hi Connie, I saw your comic on Reddit today. Just wanted to say great work and keep it up! It's better to be single than married to a wrong guy, 寧缺勿濫。Love your awesome cartoons, keep up the good work. I love your comics; make more like this one, that are funny, but true! Good luck finding the right person for you. Love this! Works for Indian patents too! I particularly like the pitch fork and parents in the second screen. Your comics are always so wonderful! Keep up the amazing work! Connie! Thank you. Hits home. My Indian parents are exactly as portrayed! 30s and being single is a disaster. Thanks for actually putting this down on paper. Love it. I like you and your comics :) Keep it up! This is me! My name is Connie also! I got married in my 30s, and YES, he has a pulse! All parents should know, miracles can happen! Hi Connie! I just came across your comic today and have spent the last hour scrolling through your blog...I love your work!!! This is gold! You are so talented Connie. I love your work. Hi Connie, I'm jazmin. I just scrolled through your site. I love it! Your so talented! Very good to see the comments on this one. Great work Connie. You have distilled a complex idea down very elegantly. Love your work! 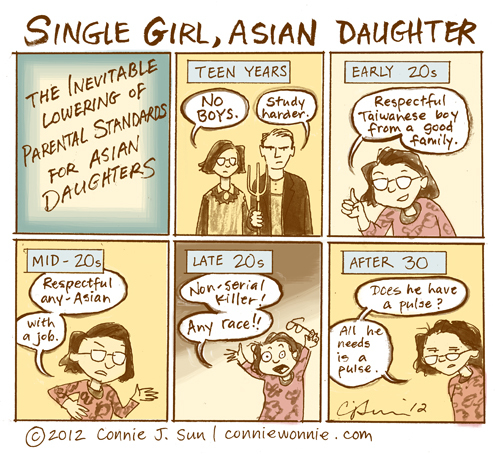 Came here because of this comic, which we've been sharing like crazy on FB bc it's TRUE. Showed my parents, they laughed, and asked when were they getting their grandson... sigh. Use this app to spy snapchat that allows you to, wait, that's a secret... to spy snapchat and steal photos.